KATHMANDU, April 11: In a fresh attempt to bring the agitating Madhes-based political parties on board the local elections, the government registered a new constitution amendment bill in parliament on Tuesday. Hours before registering the 11-point new amendment bill, the government withdrew the previous amendment bill from parliament. That bill had been under discussion in parliament for five months due to lack of political consensus. 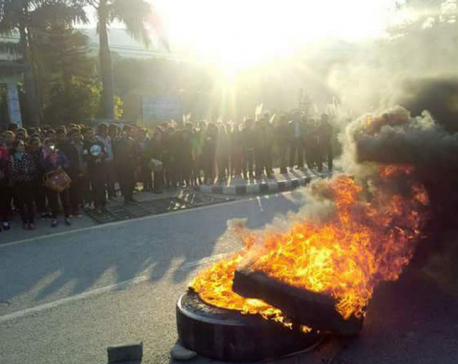 Ministers have said that the new bill is expected to address the demands and conditions of the agitating parties, ensuring their participation in the local polls scheduled for May 14. The amendment bill has proposed allowing the federal parliament to change the boundaries of a province without the consent of the provinces concerned, until such time as the provincial assemblies are constituted. It also proposes forming a new commission entrusted with responsibility for settling disputes related to provincial delineations. Madhes-based parties have been demanding removal of Article 274 of the constitution that makes it mandatory to seek the consent of the provincial assembly concerned before making any changes in the boundaries of the province. This provision had stopped the present ruling coalition from removing six hill districts from Province-5 as demanded by the disgruntled Madhesi parties. The amendment bill, registered at the parliament secretariat Tuesday, has stated that “The Federal Parliament can change the provincial boundary even without the consent of the respective province until the provincial assembly is formed”. The amendment proposal has further explained that after the formation of the provincial assembly through province-level elections, any bill concerning boundaries must be presented for prior consent to all the provinces. Once the new amendment bill is approved by a two-thirds majority of parliament, the Federal Parliament will be able to change the boundary of any province without approval from the respective province. Likewise, the bill proposes adding a new provision in Article 274 to make the prior consent of all seven provinces mandatory while making any changes in the list of powers of the provinces. The constitution amendment proposal registered in parliament Tuesday evening, also proposes removal of the chiefs and deputy chiefs of municipalities and rural municipalities from the Electoral College to elect National Assembly members. 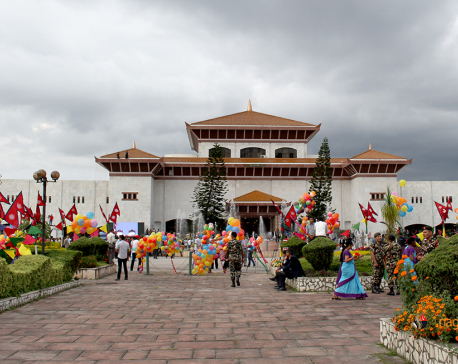 Experts have criticized this move, stating that it would curtail the powers granted to the local level bodies by the new constitution promulgated through the Constituent Assembly. With the endorsement of the proposed amendment to Article 86 of the constitution, only members of the provincial assemblies will be allowed to vote to elect members of the National Assembly. 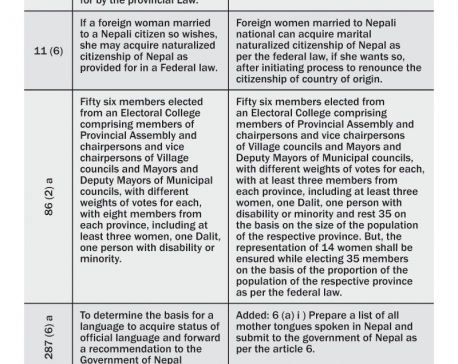 The amendment bill has also proposed that at least three representatives from each province must be included in the 59-member National Assembly and the other 35 members should be elected on the basis of population. The remaining two members are to be nominated by the government. The existing constitutional provision states that the 56 members will be picked from each of the seven provinces in equal numbers. The bill has also proposed that all mother tongues are to be included in the schedule of the constitution based on the recommendations of the language commission. The new amendment bill, however, has made no changes to the provision related to the language and citizenship issues proposed in the existing bill, which was registered in the legislature on November 29. Earlier, Law Minister Ajay Shankar Nayak had withdrawn the previous amendment bill from parliament. Withdrawing the bill, Minister Nayak said that all political parties should come to a consensus for ending the political deadlock. “We should give a positive message to the people through consensus,” said the minister.